Add a 10/100Mbps Ethernet port to a USB enabled computer system. 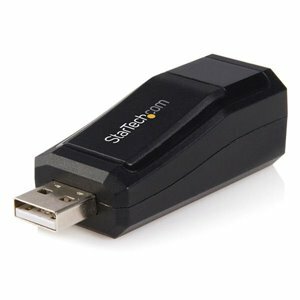 This compact USB 2.0 to 10/100 Mbps Ethernet USB Network Adapter offers convenient Ethernet connectivity - simply connect the network adapter to an available USB 2.0 port on your laptop computer, then connect the adapter to the Ethernet network.Providing full/half duplex operation on both 10Mbps or 100Mbps Ethernet connections, this USB 2.0 Ethernet adapter supports data transfer rates of up to 200Mbps, providing a fully integrated, cost-effective and reliable solution to notebook users requiring Ethernet connectivity. This compact USB 2.0 to 10/100 Mbps Ethernet USB Network Adapter offers convenient Ethernet connectivity - simply connect the network adapter to an available USB 2.0 port on your laptop computer, then connect the adapter to the Ethernet network. Providing full/half duplex operation on both 10Mbps or 100Mbps Ethernet connections, this USB 2.0 Ethernet adapter supports data transfer rates of up to 200Mbps. Provides a fully integrated, cost-effective and reliable solution to notebook users requiring Ethernet connectivity.